* Why Become A Distributor? * Textile & Garment Rental "ADD-ON"
Sweet lavender is a plant of mystical qualities that are both intoxicating and therapeutic. It is the most widely utilized essential oil in the world today. The genus, Lavandula, includes 47 known species of this fragrant, flowering plant. Although indigenous to the Old Worldand found in profusion everywhere from Cape Verde and the Canary Islands, Europe across to northern and eastern Africa, the Mediterranean, southwest Asia and China to southeast India, lavender is planted in gardens all over the world. While clearly its fragrant, calming aroma has always been appreciated throughout history, it has recently become one of the most popular scents used in aromatherapy, ambient scenting, cleaning products and more. In fact, in Latin American, it is the largest selling aroma used in the cleaning product industry, subsequent to pine and lemon. Lavender’s powerful antioxidant, antimicrobial, sedative, calming and anti-depressive properties have been used both cosmetically and therapeutically for many centuries. Our ambient air care masters rely on this essential oil for our unique formulations perhaps even more than any other oils. These small, aromatic, evergreen shrubs are known for their tapered leaves and purplish flowers and their blooms and stalks have been used in medicine and perfumery since the days of antiquity. The practice of using infused aromatic oils as a mood enhancer is thought to have originated in China. Little is known about the very first culture to use essential oils specifically, but the Egyptians are credited with developing one of the first distillation machines to extract essential oils from cedar-wood, clove, cinnamon and lavender plants. It is said that when the tomb of King Tutankhamen was opened back in 1922, the faint scent of lavender, some 3,000 years old, still lingered within the folds of the royal, golden casket. Other ancient societies utilized lavender as well. The Greeks referred to it as herb nardus, so named after the Syrian city of Naarda. They used it to fight insomnia and treat backaches. Lavender was an daily commodity under the hegemony of Rome. It was used in cooking, bathing rituals and scenting the air. Lavender oil was a component in their soaps, which Romans carried with them all across the empire. They also prized lavender as an antiseptic with powerful healing properties. For the average Roman laborer, the cost of a pound of lavender flowers was tantamount to a month’s wages! During the Middle Ages and the Renaissance periods in history, French women who took in washing for hire were known as “lavenders.” Not only were clothes washed in solutions containing the fragrant herb, they were also laid out to dry on bushes of lavender. The dried flowers and stalks emitted a pleasant smell that lingered on both clothes and bed linens. Lavender also scented cabinet drawers, perfumed the air, warded off infection and healed wounds. Scientific study and research has only recently begun to technically evaluate the wide range of benefits associated with lavender oil. The science of aromatherapy owes its entire existence to lavender. Its very name, in fact, was derived in 1937 when a French chemist named Rene-Maurice Gattefosse suffered a burn while working in his laboratory and discovered that lavender essential oil helped it to heal. Our many customers clamor for lavender essential oil for use in their many scent creations. Primarily used in perfumes and soaps, lavender is found in household cleaning products, deodorizers, candles and food products. Known for its antiseptic and antibiotic properties that kill bacteria, alleviate the pain of bee stings and migraines, heal burns and ward off moths in clothing closets, it is also used to calm horses, promote restful sleep and balance emotions. Several specific lavender studies are worthy of note. They attest to lavender’s beneficial effects and restorative powers. These include: mental alertness, memory recall, reduction of anxiety, depression, acne and other skin conditions, stress and insomnia. In 2005, a study performed at the University Clinic of Neurology in the Medical University of Vienna, Austria, conducted by Johan Lehrner and associates and published in the scientific journal, Physiological Behavior, investigated the impact of both orange and lavender oils on the anxiety levels of patients awaiting dental procedures. Findings reinforced previous beliefs that these combined scents aided in altering emotional states and reducing anxiety. In 2012, the J. Medical Association in Thailand discovered that lavender relaxed study participants, improved their mental alertness, decreased anxiety and elevated levels of euphoria. That same year, another pilot study conducted by Conrad and Adams in a large Indianapolis hospital focused on 28 postpartum women who, after four weeks of exposure to lavender aromatherapy treatment, experienced significant reduction in anxiety and depression. In 2013, a significant study published in the International Journal of Psychiatry in Clinical Practice discovered that 80 miligram capsules of lavender essential oil daily alleviates anxiety and depression with no adverse side effects. Some of our clients manage nursing homes and senior care facilities. The combined scents of lavender and vanilla when employed in such settings aid in maintaining calmness among agitated patients and help to induce the recall of comforting memories. One study in Japan revealed that the employment of lavender within a work setting helped to decrease the number of errors made by clerical staff in two separate trials. The scent of lemon helped reduce keyboard errors by 54% while the sent of lavender reduced errors by 80%. This essential oil soothes complexions and aids in the elimination of acne.Lavender oil contains antioxidants that retard the aging process and lessen skin damage. For older skin, it can reduce spots and sunspots. It is also naturally antimicrobial and serves as a force that helps to remove dirt and bacteria from skin. It is for this reason that Air-Scent, through it perfume manufacturing division, Alpha Aromatics, utilizes lavender essential oil in formulas that are then incorporated in the production of lotions, soaps, shampoos and skin care products. While research is ongoing, it is known that lavender alleviates the pain of headaches and anxiety. It also improves brain function by enhancing the quality of sleep. Research about lavender is in an active adolescent stage, and even though scientists have gleaned much already about the powers of this fragrant shrub, the following are some facts that are not so well known. The word, lavander, derives from the Latin verb, lavare,which means to wash. This is an interesting connection to ancient Rome where it was used daily in bathing rituals. Native to southern France, lavender is also found in profusion in many of the Canary Islands. Lavender is a member of the mint family (Lamiaceae). When the lavender plant is already mature, it no longer needs water. It can survive drought and requires little care. Introduced to England in the 1600s, Queen Elizabeth liked to have lavender jam served at her dining table, which triggered a flourishing production of lavender at that time in British history. During the 16th century when the Great Plague decimated European populations, French glove-makers living in London had special licenses to perfume their wares with lavender, which was mistakenly believed to have the power to ward off the contagion. It is said that this royal ordered to have the floors, linens and furniture of Windsor Castle washed with lavender. She loved the essence so much that she appointed a woman named Miss Sarah Sprules to serve as Purveyor of Lavender to the Queen. 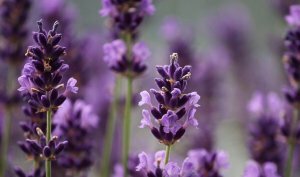 Nurses used lavender as a dressing to treat the wounds of injured soldiers, and French surgeon, Jean Valnet, also used lavender oil during World War II to help treat grievous wounds. Lavender is like a magnet when it comes to attracting bees to a garden. Its fragrance provides both pollen and nectar as nourishment. It also blooms during a mid-summer gap when bees do have many food sources. Many European masters used lavender to improve the quality of colors on their oil paintings. They employed lavender essential oil as a solvent long before distilled turpentine came into vogue. Air-Scent is ambient air-care and ambient air-care (scent marketing) is Air-Scent. The two are inextricably linked and have been for the last seven decades, since the very first fan-air freshener dispenser was invented back in 1948. 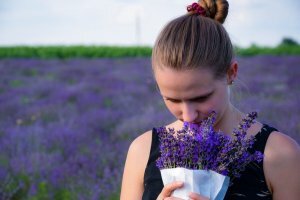 Lavender and other essential oils provide the basis for their unique blends of air fresheners, colognes and environmentally sound hygiene-related products. This leading American manufacturer of air-care systems services an enormous range of clients all over the world engaged in every modern industry under the sun. They provide commercial HVAC air-freshening systems, odor control products and ambient aromas to scenting companies, distributors and route service operators. Some of their ambient scenting machines are listed below. A few are more adaptable to larger commercial areas, while others fare perfectly in smaller commercial spaces. 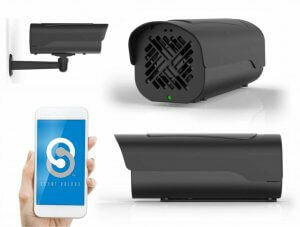 For effective, consistent scenting in lobbies, large reception areas, party rooms and public and fitness areas up to 50,000 cubic feet, the Aroma Beam dry vapor fragrance diffuser system is the best choice. It features no-spill Scentsia refill cartridges that eliminate malodors with a myriad of diverse scent selections that can even be customized to enhance seasonal and holiday themes. Fragrances can also be customized to suit any mood or purpose. Offering superior scent enrichment for any small space, particularly but not exclusively for restrooms, this fan ai- freshener features a modern design that provides optimal airflow. It is very versatile, as it can accommodate many Air-Scent refill types, including bottles, liquid, can and Solid Square wafers. Other features include: a top-performing air velocity fan blade; easy conversion from battery to electric and an air-flow retardant that lessens output when desired. The challenge of maintaining spotless and odorless bathrooms can be solved with the employment of Air-Scent’s professional air-freshening systems. 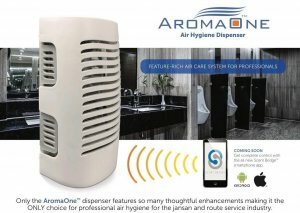 These include: the battery-operated Millenium Fan Air Freshener Dispenser, which can accommodate all types of Air-Scent refills; the time-tested Odyssey Dispenser, which is famous for the maximum air-flow its three-way ventilation allows; the Odyssey Drip Dispenser which cleans and deodorizes washroom fixtures and is non-battery operated and last but not least, the Aeon Advanced Air-Freshener that can instantly convert from passive operation to battery-driven fan power. Air-Scent, ambient air-care and the powers of lavender essential oils can alter the ambiance of your commercial space, no matter how large or small or whatever industry it serves. If you’re a scent marketing company or supplier, or you’re looking to infuse a sense of calm within your business interior, speak with our team today! Air freshening scent marketing systems, scent air machines, fragrance refills, HVAC systems, vaporous odor neutralization and more. If you're an air care supplier, Jan San supply company or would like to become a distributor of our air freshening products anywhere in the world, we're the perfectly equipped partner. Browse our guides to each of the following categories and learn why we're the preferred supplier the world over. © 2017 Air Scent | Web Design by Seopya | Web Development by Higher Images, Inc.